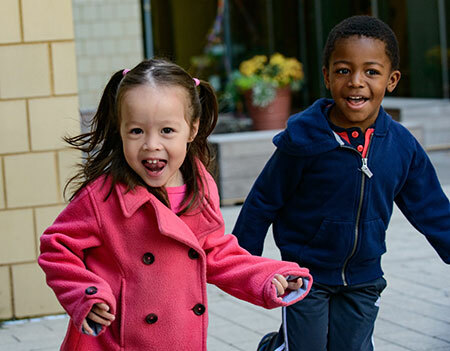 We believe that the intellectual and emotional lives of young children develop best in a setting in which teachers, the environment, and the program support play and exploration and the construction of relationships and ideas. Walk into a Lab N/K classroom and you’ll notice how many different activities are going on at one time. This is the “negotiated curriculum” in action: teachers prepare an environment filled with possibilities and encourage choice, initiative, exploration, and collaboration. Behind it all is the teacher’s belief in the child’s capacity and motivation to figure out the world and the desire to represent his or her ideas. Children arrive at Lab’s doorstep eager to get involved. Teachers respond with programs that support this drive for understanding, autonomy, and competence. Classrooms are designed so that a child can function as independently as possible, helping the child experience confidence and competence as she chooses what to do. Once the child has learned routines and how the room works, he is free to be in charge of time within those constructs. It is the child’s world in which to enjoy, explore, think, and play. In kindergarten the scope widens to include leaving the classroom for library, music, and physical education taught by specialists. Whether acting out stories they’ve dictated, listening at story time, writing using invented spelling, or talking at “show and tell,” children are immersed in language and its many uses. Days are filled with mathematical thinking as children figure out how many days they’ve been in school or how to follow a recipe. Projects link language, science, and art media—paint, clay, music, movement—adding depth and breadth to a young mind’s understanding. Their teachers asked them to look thoughtfully and ask themselves, "What story is the photographer trying to tell?"